E204 is probably the most dramatic color in Ellis Faas' Milky Eyes range. It's a rich ivy green with maybe a hint of teal in a certain light. 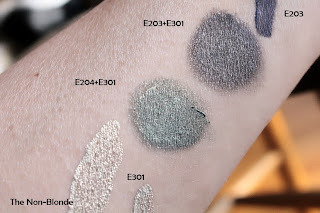 The finish of E204 is similar to the other Ellis Faas eye shadows in this series, as they're all made as a cream-to-powder formula (see my reviews of E203 and E205). It makes them incredibly long-lasting and versatile. 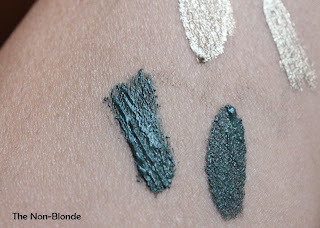 The amount of product that comes out the first time you use Milky Eyes is way too much for a normal application (meaning: creating a look one can wear for leaving the house). What you see here is at least three times what you need. After that first squirt, though, you can control the dispenser better and not waste as much as I did here. 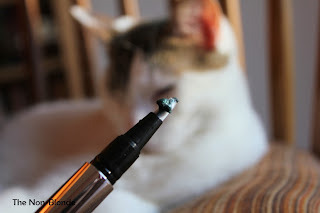 There are many ways to use Ellis Faas Milky eyes. The deeper colors blend wonderfully into a smoky eye look. You can use them alone, in various combinations, and as a base for a powder eye shadow, especially if the latter is too sheer for your taste. The satiny finish of Milky Eyes can also be manipulated and made more glam by mixing in various amounts of Ellis Light E301. The swatches above show a 50/50 ratio (and too thick of a layer), so the silvery cast is very strong. Bottom Line: lovely. And once again, it's not for a beginner, but utterly worth the time and effort it takes to learn how to use this product. Ellis Faas E204 Milky Eyes ($36) is available from SpaceNK, ellisfaas.com and sephora.com. Also at Sephora Meatpacking district in NYC. The product was sent to me free of charge by the company. 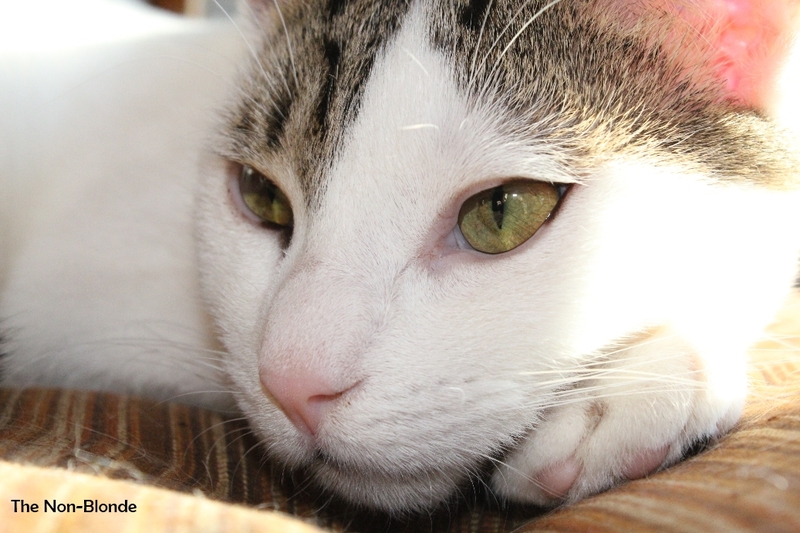 Bonus photo: A closeup of Olivia. This color looks wonderful, I'm a big fan of EF products. I have 104 and 105, how does the texture, coverage and color intensity differ from 204? That was my first (and only, so far) Milky Eyes, it was part of the 2011 Autumn Set I bought online to get to know the brand. It ranks among the longest lasting cream shadows I ever wore. I just can't apply this straight from the tube: I usually scoop out the product from the applicator brush on my pinky finger and them use a Sephora cream shadow brush to apply it.